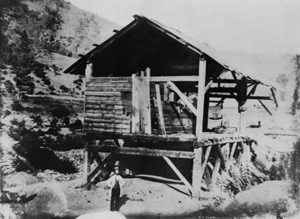 James Marshall’s discovery of gold at Sutter’s Mill in California in 1848, started the California Gold Rush. Born in 1810, Marshall followed in his father’s footsteps by becoming a skilled carpenter and wheelwright. When his father died in 1834, he headed westward, spending some time in Illinois and Indiana before settling in Missouri. There, he contracted malaria and at the advice of his doctor, he moved westward again. 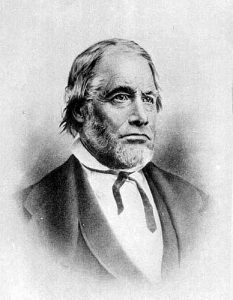 In July 1845, he arrived in the Sacramento Valley and began to work for John Sutter as a carpenter. Fairing well there, he improved his economic prospects, purchasing a ranch, and began to raise cattle. In 1846, he joined John C. Fremont’s California Battalion, and participated in the Bear Flag Revolt, a bid to seize control of California from Mexican control. When he returned to his land, he found his cattle had been stolen and he was forced to sell his land. He then formed a partnership with John Sutter to build a sawmill. 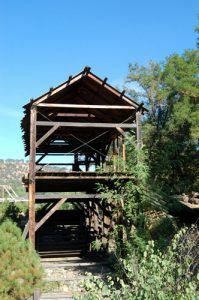 It was at the sawmill that, on January 24, 1848, he discovered gold in the water flow through the mill’s tailrace. He immediately advised Sutter, who swore all his employees to secrecy. But, the “news” was just too big, and in no time it leaked out. James Marshall at Sutter’s Sawmill, Coloma, California, 1851. As word quickly spread, some 80,000 miners flooded the area, extending up and down the length of the Sacramento Valley, and overrunning Sutter’s domain. Ironically, neither Sutter nor Marshall ever profited from the discovery that should have made them independently wealthy. Though Marshall tried to secure his own claims in the gold fields, he was unsuccessful. His sawmill also failed, as every able-bodied man took off in search of gold. 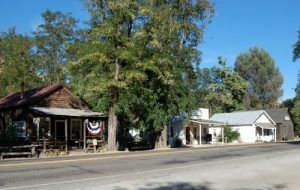 Soon, the area surrounding Sutter’s Mill became the first mining boom town in California – Coloma. Embittered, Marshall left the area, drifting from place to place in California, looking for yet another rich strike. In 1857, he returned to Coloma and started a vineyard in the early 1860s. Initially profitable, his endeavors as a vintner would also fail when, by the end of the decade, increased competition and less demand put him out of business once again. Marshall then returned to prospecting and wandering about the state. He soon partnered up with another miner in a gold mine near Kelsey, California. However, the development of the mine proved expensive and yielded nothing, leaving the unlucky Marshall once again close to bankruptcy. In 1872, Marshall had a turn of luck when the California State Legislature awarded him a two-year pension in recognition of his role in an important era in California history. The pension was renewed in 1874 and 1876 but lapsed in 1878. According to the legend, Marshall then went to visit the legislative assembly in person to get the pension renewed again. However, when a brandy bottle dropped from his pocket and rolled on the floor, no additional pension was awarded. Marshall continued to live in Kelsey, in a spartan homesteader’s cabin, earning money from a small garden until his death on August 10, 1885. His body was then taken to Coloma and buried on the property where he had owned his vineyard. Overlooking the south fork of the American River, a monument was erected over the grave site in 1890. Atop the monument is a bronze statue of Marshall, pointing to the spot where he changed California history.